An ice cream shop is a specialty food store that capitalizes on the consumer's love for sweet and creamy treats at all times of the year. In the past, ice cream shops struggled during the winter months, but consumers have been gradually developing a taste for these sweet treats even during the coldest months of the year. 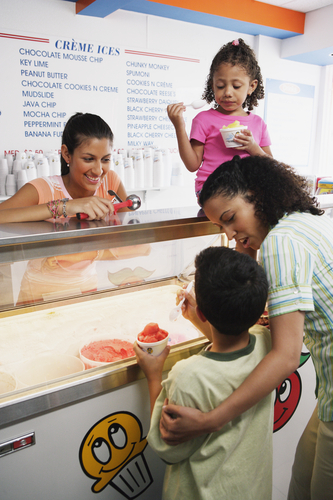 Ice cream shops usually have low overhead costs and generate high profits. Because an ice cream shop specializes in a specific type of food, the cost of ingredients are relatively low. Also, ice cream shops are generally small establishments, so the cost of renting the space and paying for utilities is small when compared to other chain restaurants. If you own an ice cream shop, but aren't generating profits in spite of these advantages, you need to increase your ice cream sales. Here are some great ways to sell more ice cream. You can market your ice cream shop online, in newspapers, on the radio, and on television to increase the amount of ice cream you sell. When people know about your shop, they are more likely to think of it when the ice cream craving hits. Deals and discounts will encourage consumers to flock to the doors of your ice cream shop. You can offer discounts for kids that will encourage parents to spend their extra money on ice cream. Two for one discounts or "happy hour" discounts on specific ice cream flavors is a great way to get rid of surplus ice cream. Selling ice cream by the gallon or the pint is another great way to increase ice cream shop profits. Consumers love to buy ice cream to save and eat later. Selling it "off the cone" will increase your ice cream sales. Never underestimate the power of a free flavor sample. When you advertise free samples, customers come running. Many customers can't resist buying an ice cream once they have sampled the delicious goodness of this creamy treat. One great way to sell more ice cream is to distribute your products to other venues and establishments that may be looking for locally made ice cream to add to their product list. Restaurants and grocery stores, for example, often purchase local products because it helps to establish rapport and good relationships with local customers. You can dramatically increase the amount of ice cream you sell throughout the year just by offering packaged ice cream to local businesses. Making a few phone calls to restaurants and grocery stores in your area may be all that it takes to tap into a huge new market for your ice cream creations. Just make sure that your ice cream is made entirely by you and that it is marked with a clear expiration date. You may also need to contact food authorities to be sure that your ice cream can be sold to other businesses in your area. Ice cream shops may be considered a softer type of eating establishment, but ice cream shops are capable of generating incredible profits, especially during the peak selling months of summer. If your ice cream shop is struggling, you obviously need to start selling more ice cream. Following these simple steps will help you boost your shop's profits in no time.